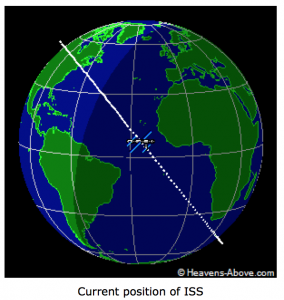 Did you know that you can see the International Space Station (ISS) from Earth with your naked eyes? Spouse told me that he’d seen it fly by one night. I didn’t believe him at first. So of course I Googled it and then my memories of everything space from about fifth grade, reminded me that the country freaked out in the 50’s when people learned that Sputnik had been launched by the Russians and could be seen through binoculars proving that the US had been beaten to space by the USSR. Of course, Sputnik was tiny in comparison to the ISS. The ISS as manmade space objects goes is HUGE! And when you see it with your bare eyes you’ll understand. It really is quite visible and bright no binoculars needed. There are both apps and websites to help figure out when and where it’s visible (along with a lot of other interesting stuff). Here are links to a few of them.